Prof. Olivia Moy (seated) with members of the LGBTQ+Alliance. 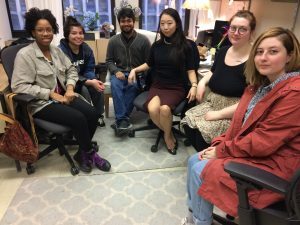 Professor Olivia Moy, of the College’s English department, is on a mission to revitalize a dormant student group that she believes is a critical “source of solidarity” for lesbian, gay, bisexual, and transgender students on campus. Thanks to her efforts, a new club—the LGBTQ+Alliance—now exists. Which is why President José Luis Cruz’s campus-wide email on February 24, in response to the federal government’s decision to rollback transgender students’ rights, was so welcomed by the members of the LGBTQ+Alliance. “We will use this turn of events as motivation to redouble our efforts to ensure a safe, non-discriminatory campus environment for our transgender community members, acknowledge and respect each person’s chosen gender identity, make sure that access to campus facilities according to one’s gender identity is upheld, and raise our voices to ensure that these protections are available to all Americans regardless of where they happen to live, work, or study,” President Cruz wrote. At a recent meeting of the Lehman LGBTQ+Alliance, some of the new club officers, including faculty advisors Moy and English Professor Justin Porter Stephens, discussed the organization’s wide-ranging goals and plans for its first open meeting later this month. The officers who attended the meeting said they generally felt the Lehman community had been supportive of them, but they have experienced incidents of homophobia around the Bronx. “Some of these instances included verbal attacks on the street late at night, or even seeing rude comments with homophobic language written on the margins of textbooks,” said Moy. Every student in the club has their own coming out story—or in the case of two sisters, a non-coming out story. Deirdre and Zoe Fanzo are openly gay students, and president and secretary respectively, of the new LGBTQ organization. Zoe pointed out that in her Bronx family, three of the four Fanzo siblings are queer. Others in the group have had a more difficult road with coming out. A male student from India never had the cultural freedom to do so in his homeland. But when he moved to New York, he found support and freedom from living with a gay couple who served as his host family. “We want to attack problems with brains, and scholarship, and discussion,” said Moy.